New York: Avon Books, 1983. 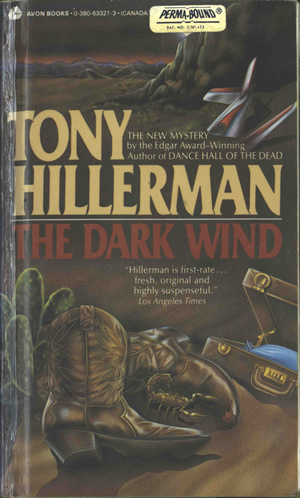 This is the Avon paperback edition of The Dark Wind published by Avon in 1983. The book designer is Susan Hull. The front cover illustration is similar to other Hillerman novels published by Avon, and features a pair of cowboy boots in the foreground, with the tail of an airplane and mountain skyline in the background. Contents: [i] brief description, [ii] Other Avon Books by Tony Hillerman, [iii] title, [iv] imprint and copyright K-R 12 11 10 9 8 7, [v] dedication, [vi] blank, [vii] AUTHOR'S NOTES, [viii] blank, 1-214 text, [215-216], advertisements. Binding: Paper covers with full color illustration, author, and title on front cover; back cover includes brief novel synopsis and detailed inset from front cover.